Jacques Rancière, Philippe Lafosse and the public in conversation about Straub-Huillet’s work after a screening of ‘Dalla nube alla resistenza’ (‘From the Clouds to the Resistance’, 1979) and ‘Operai, contadini’ (‘Workers, Peasants’, 2001) on February 16, 2004, in the context of a Straub-Huillet retrospective in Nice, France. Translated by Ted Fendt (2011). Found on mubi.com. JACQUES RANCIERE: First, a word apropos the “and” of “Politics and Aesthetics”: this doesn’t mean that there’s art on the one hand and politics on the other, or that there would be a formal procedure on the one hand and political messages on the other. I will define these terms first. Politics is certainly ideas about the way to organize a community, but it’s also a real community, a certain distribution of spaces, bodies, words, capacities… As for aesthetics, it isn’t form. I would say that, there too, it is a visible distribution of time, spaces, bodies, voices… A film by the Straubs is always a way of placing bodies that recite texts in a space; bodies, texts and spaces being almost inseparable. A film by the Straubs is always characters who recite texts: none of them speak in a traditional manner—in order to express feelings, for example—or in a reaction to fictional situations. They recite texts and sometimes in the most radical of ways, like in Workers, Peasants, with a notebook in front of them. These texts are strong, literary texts, thus never sketches, never scripts. The people always recite texts that talk about community, power, people, property, classes, the shared world, and communism. Also, what I, the spectator, see in a film by the Straubs is a mise en scène that is always a mise en commun of bodies and texts, texts that concern these bodies themselves. The Straubs reject everything in the order of mediation, what happens through story, characters… Traditionally, a political film is a film where you are lead to make political judgments through stories, situations, characters’ reactions to events. Now, there is never anything like that in their films. For them, everything must be present in the relationship of bodies to these texts that talk about ordinary things. They also exclude all forms of representation, representation in the sense of a relationship between something that is there, present, and another thing that is elsewhere, absent, represented by what is there. That does not mean that there’s no absence, even if it seems to me that there is less and less in their films. 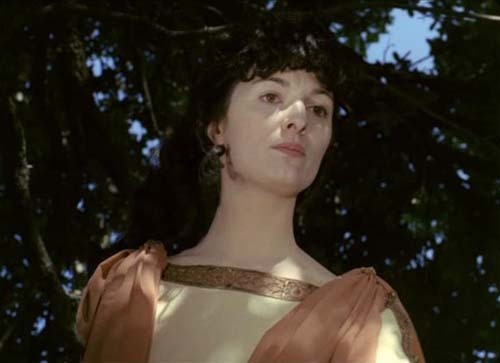 When there is absence, it can be said to be inscribed in the shot itself, in the film itself, and that it is never situated in a supposed “inside-outside” relationship: in Othon, to only take one example, the absence of the citizenry is in the film itself. After all, there is always a privileging of the direct, the present, which is marked in the treatment of time and space, in the treatment of the texts: space and time are always real spaces and times. To put it differently, they are never presented as fictional constructions and the characters say their texts over the noises of cars, insects, or variations in the light, of the air with time… Workers, Peasants is, from this point of view, exemplary of their methods: they remove blocks from a text that are theatrical blocks, blocks of dialogue. In this instance, these blocks are lifted from a book by Elio Vittorini, Women of Messina: these are four chapters of an eighty chapter novel, a novel made of assemblages and using different types of narration. In the book, these four blocks are stories that the people tell to someone who was absent from the community during winter. The entire context disappears in the film so that only the stories remain. In general, the modifications that the Straubs bring to the texts are very limited, but we can say that they consist of two kinds. Firstly, and this is also exemplary in Workers, Peasants, one goes from prose to a type of versification: with the actors, they transform Vittorini’s prose, which is written in continuity, into verses. Secondly, they always go from an indirect style to a direct style: for them, there must never be quoted words, they suppress everything that is in the third person, quoted voices or narratives, they don’t tolerate such things. There are never stories, but only dialogues, meaning uniquely words that are words performed and always kept in the first person. From which maybe sometimes come certain problems…like in From the Clouds to the Resistance, adapted from César Pavese. While the first part, consisting of dialogues taken in blocks, is perfectly satisfying, to my eyes the second part is less so: in only wanting to keep what can be put in the direct style, they eliminate a whole part of the novel, which is essentially a flashback. And, in this case, eliminating what can’t be treated in a direct style is to my eyes regrettable because this has the consequence of narrowing the novel and concentrating on the explicitly political issues, such as the priest’s speech or the statements of the reactionaries at the bar, which ends up losing something from Pavese. But let’s say that it’s their point of view: they don’t like narratives, everything must be direct. 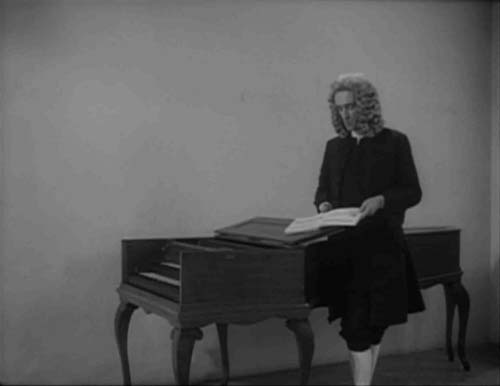 With the notable exception, it’s true, of Not Reconciled and Chronicle of Anna Magdalena Bach. RANCIERE: There is most certainly an important evolution over time. I would say that, if an open-air theater is involved, we nevertheless pass from a one kind of theater to another: let’s say from Brecht to Hölderlin or, if you prefer, from a dialectic dispositif to a lyrical dispositif. This is a change of the dispositifs meaning that, I believe, is also a change of Marxism and of Communism between the films of the 1960s and their latest films. In the first configuration, what I’m calling the dialectic configuration, at the center there is a relationship of tension and opposition between words, what the words mean, and those who say them. I’m thinking in particular of Othon and History Lessons, films from 1969 and 1972. History Lessons is based on Brecht’s text The Business Affairs of Julius Cesar, a book that also presents itself in the form of interlocked narratives: supposedly living a bit after Cesar, the narrator goes to interview a witness, a witness who is getting rid of a manuscript of the freed slave who took care of Cesar’s accounts. Already at that time, and a bit like in Workers, Peasants, the Straubs made a selection: they take the dialogues, the characters’ discussion about Cesar’s career, etc., so that the film is a straightforward political lesson. 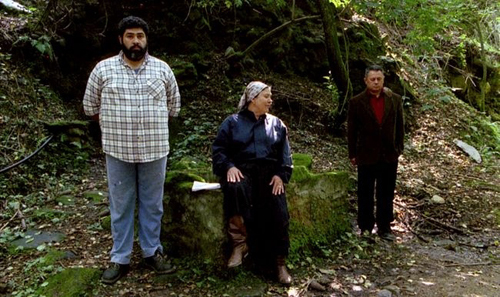 Finally, these distinguished people, seated in a garden, make us understand that the logic of profit, the permanence of economic interests and class struggle underlies wars, revolutions, changes of leadership or forms of government. It is a straightforward lesson given across a series of processes of disassociation, gaps between bodies, texts and space. 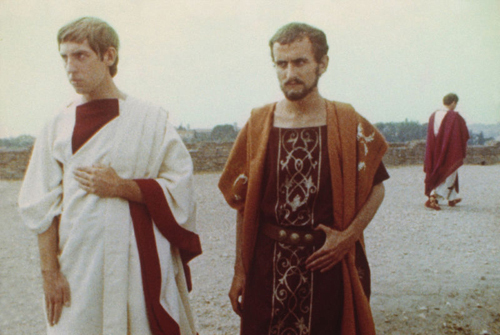 These dialogues borrowed from Brecht are recited by figures in Roman togas, who talk of Julias Cesar’s business affairs the way we talk about those of Jean-Marie Messier, except that they are in the garden of a villa in the present, arrived at by car. Moreover, their conversations are cut up by long sequences where people drive in the packed streets of Rome. A question: what relationship is there between traffic jams, the world, car horns, noise and the rest, between this contemporary urban city and the conversations in togas? It seems to me that there is an almost automatic distancing effect here. A game of current events is set up, a distance is created. It’s always the same and, at the same time, precisely, the distance is marked, the strangeness of this business is marked. After all, these car rides that have a pointless feeling are a way of miming the dialectic exercise. It’s a way of telling us to pay attention to the text, to those who recite it, and that it is necessary to learn to read reality on the model of the attention that one brings to the hazards of driving. It’s a bit of the same thing in Othon, Corneille’s tragedy recited in its entirety and recited on Mount Palatine, in the ruins of ancient Rome that overshadow modern Rome. It’s based here again on a system of gaps in the topography and gaps in the diction of the text. At the topographic level, first… This tragedy about clashes for power after Nero’s fall, this text, in sum, about Rome’s destiny is filmed on Mount Palatine between two Romes that are both absent: one is only ruins and the other is below. 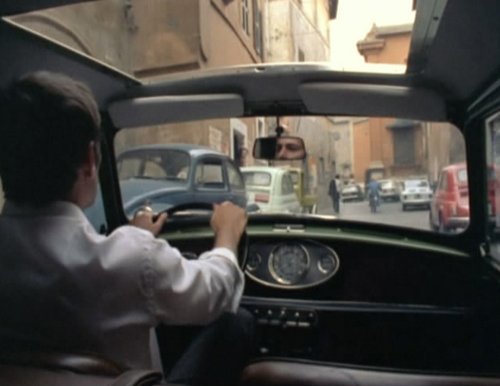 In most of the film, we hear, sometimes we discover, far below, modern Rome, with its cars and aggressive noise. RANCIERE: Also, you could say that the text is situated in a space presented twice as inadequate. If we consider the diction of the text now… We notice that it is said by mostly Italian actors and in a monotonous and accelerated manner, as if the overall meaning was more important than the exactness of the text. It’s very different than what we saw this evening. In Othon, the talk is fast, a part of the text is chewed up, and we understand well that it is a supplementary demonstration that all these beautiful words are after all great intrigues between them, distanced from the people, and behind their backs. In these films from the 1970s, the dispositif that I’m calling dialectic makes it so that the texts are directed by their differences—the collision of words and things, the collision of the past and present…the collision of the working class and the nobility. And this collision is supposed to have a revelatory function; it is supposed to show the contradictions inherent to social reality. We therefore have a theater for a spectator Brecht dreamed of: the actor in social conflict is supplied the means to read reality, given the knowledge of what the words mean and so on. It is political cinema that operates the basis of demystification, of unmasking…of disrespect, and that allows a certain state of the world to be understood, meaning the state of the class struggle. The second dispositif, that we find later, for example in Workers, Peasants, is in my opinion completely different, even if there are still rather immobile bodies in a large, natural space. In Othon, Corneille’s text was sort of made into prose. Now, what is striking in Workers, Peasants is that there is, instead, a sort of versification of Vittorini’s text, like a desire to magnify each word, almost every syllable, and this is notably thanks to a kind of over-articulation. I would also say that their recent films substitute the dialectical dispositif of the past, made of disagreements and disassociation, with a lyrical dispositif of agreement between text, body, and place. In regards to the story, for example, it is now no longer about revealing the more or less seedy reality of the business affairs of the elite, but it is now about demonstrating in a directly visible manner the way in which people deal with their own business affairs. At its core, it is about directly demonstrating the power of a communism that is not a goal to obtain by arming oneself for a future battle, which is also not a past, nostalgic episode, but that is already and still here, and that, in a sense, is here forever. Therefore, there is a dispositif of agreement between what is said and the words that express it: we are no longer in the dissociation between words and the visible but rather in the relationship between equality itself in the visible—that is there, this stays, this continues—and speech, both dramatic and lyric. By dramatic speech, I mean words exchanged by characters in conversation. The construction of Workers, Peasants is remarkable from this point of view. Groups oppose one another: workers and peasants, leaders and masses, men and women… Each speaks in turn, lays out his or her problem. 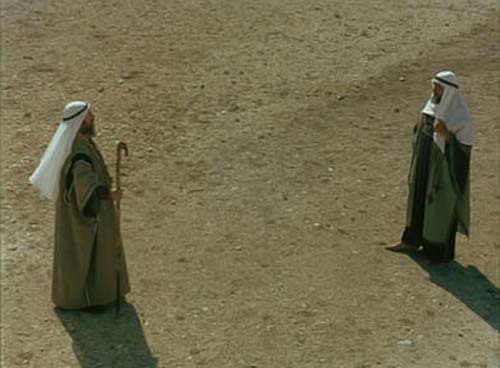 Each is in his own shot—it is very rare in the Straubs’ films that partners in an exchange are in the same shot; when they are, it’s generally from behind. Each one reads his text or looks at it or looks in front of him in an undetermined direction. None of the characters look at those that they are talking to. It’s like a kind of absolutizing of words, it’s as if everything was in the words. And these discussions between workers and peasants, between leaders and masses, between men and women, between the faithful and deserters, etc. are not heartrending dramas like in Comolli, for whom these conflicts are dissociated elements; in the Straubs’ films, these are, to the contrary, elements of consistency. This communist people exists. It exists in its own division and, at its core, by its capacity to affirm the division. RANCIERE: Yes, we find there their dialectical side. For there to be a community, it must be divided. One exists by two. And it is dramatic speech that speaks of this division, but not in the style of a story because they don’t recount: they declare. Thus to declare is the occasion to demonstrate capacity for communism, to begin by an ability to speak. And, on this subject, what is remarkable is that the working class characters are played by non-professional actors who do not speak a working class language: they speak a kind of poetic language, it’s practically Virgil. In such a way that there is something like a game, something like a jumbling of hierarchies. The more humble the characters are, the more grandiose their language and tone. 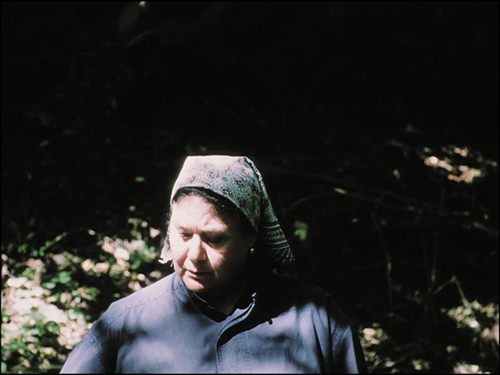 Think of the widow Biliotti, a country character played by Angela Nugara, who plays the mother in Sicilia! : she incarnates the nobility of the poor, a nobility of speech, an ability to elevate herself and to speak by bringing the greatest attention to language itself. There is nothing of a working class language; it consists, on the contrary, of a magnification. We can think of Carmela too, the one who does the accounts in Workers, Peasants and who says who leaves, who returns: everything is performed in her mouth; we constantly see her try to be at the height of the situation by her speech. We have before us the affirmation of a capacity for elevated language. And, as this speech is deployed, I would say that we pass from the dramatic content—in the sense of the exchange of arguments and disputes—to a common lyric power of words that affirm the community as it is. This culminates in the Ricotta episode and the episode of the departure to go looking for laurel, which are such great utopias staged through speech. Let’s take the Ricotta episode… She tells how it is made, how they come together around her, how it is shared, and we see that all the power of the community is put in three things: first, the savoir-faire, in the sense that, for the Straubs, there is a peasant savoir-faire that is opposed to a vision of socialist engineers or technicians; secondly, the grandness of the ceremony of sharing to which this savoir-faire leads; thirdly, language itself. This is interesting because an elevated culture—which is the culture of speech or based on speech—is often opposed to a working class culture—which is based on gesture and artisanal, manual savoir-faire. Now, here, this opposition is refuted absolutely: the same power is in the Ricotta and in the speech that talks about this Ricotta. There are no working class arts and, opposite them, bourgeois arts or arts cultivated by speech, but a shared intensity to words and what words says. At this moment, communism becomes an intensity, a degree of intensity of perceptible experiences. There is equivalency between Ricotta, sharing, and eloquent speech. It’s almost the same thing in Sicilia!, when the mother evokes the past. She is seen preparing her small dinner, there are long shots of the fish cooking, then she gets up and starts to talk of the lovers she has had, evokes the grandfather who was socialist but who nonetheless led the St. Joseph’s Day parade, and all of this is like a kind of working class grandeur that is found at all levels: in savoir-faire, in language, in storytelling, in tradition. But let’s go back to Workers, Peasants: there, Ricotta is like a communist Eucharist…like a consecration of the community. And I believe that that is an illustration of the reversal of the Straubs’ initial dispositif: the dialectical theater of the past becomes the theater where the dialectic is judged for its pretension to judge. Let’s look at Umiliati, which is in a way the sequel to Workers, Peasants, and let’s examine its dispositif. These are also short extracts from the end of Vittorini’s book—if it is only from there—it’s the end of the community, the moment when it explodes, through contact with the outside. A more or less enigmatic character who serves as prosecutor explains to the people that the world is a world of properties and that, consequently, they do not have the right to settle like this on a small bit of earth in order to make a community. 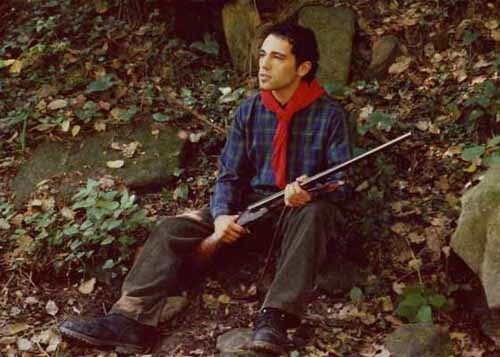 There are also three characters, who are hunters in Vittorini’s book and partisans in the Straubs’ film. And the prosecutor and the partisans explain to the others that they are rather backward: together, they form the tribunal of history. The partisans are comfortably set up in the shade, in the ravine, while the members of the community are up high, under the sun, filmed like prisoners about to be executed. They teach them the lesson, they explain to them the laws of the economy like Brecht explained them in The Business Affairs of Julius Cesar. Except here the mise en scène itself refutes these economic laws. Visually, for example, it is apparent that this discourse and these lessons bore the peasants, the worker peasants of this commune. You can see how much the mise en scène refutes them, in the smallest gestures, such as that of the old peasant who lends a hand when another is speaking in order to finish off by simply saying, “Here, it’s another affair.” What other affair? We don’t really know, but a distance and a refutation are created, a refutation of the triumphant discourse of the laws of history and progress. Likewise, when the one who I’m calling the prosecutor explains these rules to them, it is a speech worse than a legal speech, and he delivers it with a wild look and a ventriloquist’s manner of talking, which makes what should be a brief statement become a funeral dirge, so that the dialectician clearly refutes himself. And then there’s obviously the last shot: Siracusa, the leader’s companion, is prostrated on the doorstep of the house, her head in her hands, it’s over but, when the camera lowers, her hand becomes a tight fist. That is a final gesture, a final image that comes to refute the tribunal of history. RANCIERE: We can talk a bit about that if you want. What is striking in Workers, Peasants, as in their latest films, is that the place of the characters is more and more nature itself. First, nature is the subject of the discussion—hence the argument in Workers, Peasants: on one side, there are workers and what one could call the soviet ideology that wants to put nature to use, to make roads, to transform it and so on, and to order total mobilization, and, on the other side, one finds peasants, those who agree on the time of germination, of waiting, of the harvest, of rest, of respect for the earth. That is the first aspect. Next, there is nature, which is before speech, and which eventually gives up its place and its power to speech. It’s what is there, what is always there without reason, before all reason, and what does not stop acting, reproducing itself and altering itself at the same time. From which comes the importance of the continual agitation while the men and women are talking: nature doesn’t stop moving. These are insect noises, bird songs, the effects of light on the plants, the trees, on the moss-covered rocks and the dead leaves… The activity of this undomesticated nature is constant. You’ll note that we’re talking about a peasant community but that at no time do we see it in the shot, for example: this is clearly voluntary. The partner is the wild nature, the ravine, undomesticated nature; and, after all, communism, for the Straubs, in this last part of their work, must necessarily be linked to a nature without rhyme or reason. There is also a dispositif that pronounces a rupture with the idea of nature that accompanied Marxism for a long time: nature as transformable material that man must model in his image and the idea of history as the humanization of nature. One could say that, now, the Straubs’ politics and mise en scène stands up for a certain inhumanity of nature. Nature is like a continual power and rumble that limits humans. RANCIERE: I would say that the film that is the turning point is From the Clouds to the Resistance, a film from 1978 adapted from Pavese, that I’ve already talked about and that has two parts: first, six of the Dialogues with Leucò, then very selective extracts from The Moon and the Bonfires. I believe that this meeting of the Straubs with these Dialogues is very important. 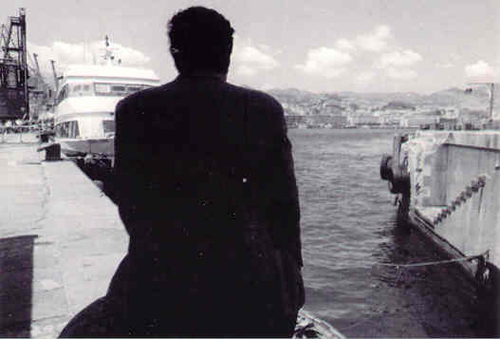 Pavese wrote Dialogues with Leucò early in the post-war period, at the time when he rejoined the Communist Party and when he was writing a novel to announce this conversation, The Comrade. But, while rejoining the Communist Party, Pavese took a considerable theoretical distance not only vis-a-vis contemporary political and social events, but also from the technical tradition of Marxism. Thus, what he wanted to do with Dialogues with Leucò was to root what had been fascism, war, resistance, and communism in a much older drama of the relationship between culture and nature. This is why he went and looked at ancient mythology and, basically, what he recreated is a drama about the origins of tragedy: we can think of the original proceedings of Greek tragedy with the quarrel between the old and new gods, the establishment of justice, the passage from a maternal time—of the time of mother earth, the titans, the monsters—to the order of the Olympian gods. In 1978, the Straubs directed these six Dialogues with Leucò on the theme of the creation of a universe of justice and, consequently, on the time of the differentiation of gods and men, on the end of the religion of the earth. But, while they directed these dialogues, I believe that they placed themselves in a drama that marks their political aesthetic more and more. At this moment, the relationship of bodies to space becomes more and more this relationship to an inhuman nature, an inhuman nature that is the basis of another idea of culture. We move to a peasant or ecological communism, opposed to the communism of Soviet engineers. After all, this nature has no pastoral qualities. It is an ancient nature: a play of forces, a play of conflicting elements. One thus finds in their work what one could call an ancient philosophy of the elements of nature—water, earth, fire, air—and their conflict. To put it differently, with this film in 1978, there is a division between the heavy elements—water, earth, elements of heaviness, duration, secretiveness, waiting—and the light, volatile elements—brightness, light, elevation, air and fire. In a sense, Workers, Peasants is a discussion between men of fire and men of the earth, and everything plays on this war that also takes places in this setting. All the elements intervene all the time. You can think of the roles that water and air, insects, and wind play, the role that fire (meaning the sun) plays. The film is a war of elements that arrives at a reconciliation: the story of the Ricotta, the story of the fire, how to make the fire… The reconciliation of the elements is conceived as an apotheosis of the community, knowing that, at the same time, nature is also what is there before all arguments, as what is nameless. That’s why I say that for me, at a point, there is in their films a reversal of the dispositif between two communisms and two mise en scènes. In the first period, what was important in their work was the power of words over images—think of Moses and Aron, with Moses as the man of words and Aron the man of images, and the Straubs who, in this conflict, are on Moses’ side—and, this period is followed by a lyrical model where the power of what precedes words affirms itself over words, when something unnameable appears that gives words their meaning, all while imposing on them a form of respect. I have voluntarily opposed these two models in a rather blunt manner here, but I think that this opposition exists. RANCIERE: It’s a bit complicated and rather dangerous. Basically, in their work there is a kind of radical materialism in the mise en scène that wants to eliminate every representational element and that wants everything to be shown, direct, present. And there is equally an idea of communism as an entirely material matter: in the place of relationships of production and productive forces, there is the Ricotta, snow, ice, stars… So there is this aspect that can be qualified as materialistic. But, at the same time, this materialism recalls the dream of the Romantic era (and that’s due to their proximity with Hölderlin and German Romanticism), meaning to the idea of a world where there would no longer be on one side the intelligible world, thought, and law and, on the other, the visible world, but a world where a common law would be incorporated in the visible world itself and where there would no longer be any opposition. This is what gives the Ricotta a Eucharistic quality, a desire to transform everything—gesture, human speech—into a sacrament. In a way it means uprooting sacraments to the heaven in order to now consecrate human bread and blood in place of the bread and blood transformed by the son of God. It is in this way that a materialism that is not against idealism, against spiritualism, is found in the Straubs’ films. There is also a second aspect that responds to this question but that, for me, is less interesting. It’s an aspect that’s a bit provocative and fashionable: you constantly are meeting people who explain that Marxism is religion, that Brecht was Catholic and Claudel a materialist… For me it’s a game, a rather simple reversal and, if it occurs to the Straubs to sometimes concede this, it remains secondary. What is essential in my eyes is really the refutation of the opposition itself that we talked about, it’s the fact that the spiritual is found entirely in the gestures, in the consecration of gestures. It’s the fact that thought is entirely found in the materiality, not in the Soviet vein of transforming of the world by thought, but by a realization of thought as in accord with the rhythm of nature. AUDIENCE: I remember in a film a scene of a supposed fusion of the hero with nature, with the stars. But the way in which the Straubs talk about the stars has nothing to do with the way in which Goethe, Novalis or Hölderlin do. For Goethe, Novalis, and Hölderlin it is always upward, while there, to the contrary, it’s downward: the hero sees the stars almost below, it’s absolutely amazing…and there is nothing inseparable about it. The relationship with nature is not inseparable at all. Also, I agree with you when you’re talking about another relationship to nature—fire, not electricity—, but not when you talk about fusion with nature. It’s also for this that the relationship with German Romanticism, it seems to me, needs to be used with a bit of precaution. RANCIERE: From progress surely, but they are deliberately anti-progressive! They want to be in this anti-progressive revolutionary tradition, in the way Benjamin criticized progress. They are developing an idea of progress completely at odds with an idea that would inscribe it in the continuity of the development of the sciences and social relationships. There is a “back to the earth” quality, in their work. This is seen in the layout itself, in the distribution of characters between high and low, between light, brightness, and appearance, and withdrawal, the earth… And this is a dramaturgy very close to Heidegger, a dramaturgy that corresponds to a certain form of contemporary thought that draws from Hölderlin a model of revolution and communism separate from progress. You may find this paradoxical but they take up this paradox with the same willfulness that Benjamin had in breaking the course of history and advocating a return to the past. Like Pavese going back to myths to re-interrogate and question the relationship between nature and culture in order to re-situate and re-think communism, the Straubs are radically isolated from the tradition that links communism to Enlightenment thought, progress, and scientific development. They demand it. LAFOSSE: To think, to feel… The fullness of the idea in the colors: it’s what Cezanne says of Véronèse. RANCIERE: There aren’t a lot, and it seems to me that there is no problematic of childhood. There are two children in From the Clouds to the Resistance because they are in Pavese’s book and his novel is also a story of transition, transmission and passage from an old order to a new order. In The Moon and the Bonfires, there is the story of the deformed boy, and that of the father and son, where a relationship between an old world and a new world is expressed, and where the child brings a negative judgment on humanity, and in En rachâchant, a film from 1982, a child resists his teacher… Does this mean that there is a child figure in the Straubs films, indeed a figure of resistance? Never forget that they work from texts that are addressed to an adult community to ask it where it is with itself, with its past, with its future and, if there aren’t children in these texts, there aren’t any in the films. It happens that the child serves certain questions but it is rare that he is really put in the foreground and treated as a character. For the Straubs, the child is not the future of the world. LAFOSSE: We’ve sometimes asked here how we’ve come to the Straubs’ films… Can you, Jacques Rancière, tell us how you came to their films? 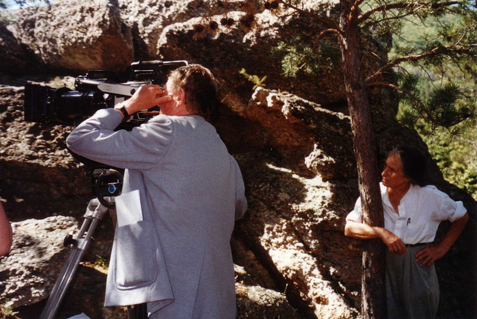 See also this film made on the occasion of the Straub-Huillet retrospective in Paris (November, 2007 – March, 2008), organised by Philippe Lafosse. And this debate with Jacques Rancière after the projection of Europa 2005, Joachim Gatti, Corneille-Brecht and O somma luce, in Paris, January 2011.